When your daughter or son is getting ready for the prom, it is a highlighted chapter of their lives. Not only does it mark graduation from high school, but it is a special social occasion when they get to have their dream date night and enjoy it with their friends. To ensure that they have a comfortable and secure ride to and from their prom destination, many parents use our party bus or limo service for prom. What types of limos do you have? When you are looking for a limousine or party bus for your daughter or son, they will surely have their own opinions. Our company offers limo service for prom with numerous popular makes and models for hire. Your daughter or son will be thrilled with choices like our Infinity QX56s, Cadillac Escalades, Hummers and many more. Our standard models include Ford Expeditions, Lincoln Town cars, and Chrysler 300s among others. You are sure to find a vehicle that will make your son or daughter proud to show up to prom! What qualities should you look for in a prom limo rental? There are certain qualities that one should look for in a prom limo service which are apart from a standard premier vehicle rental. The chauffeurs provided should be educated, licensed and reliable. As they will be transporting young adults to and from the venue. Our drivers will keep passengers safe and to bring them home at the appointed time. In case of any change in schedule, they should be able to notify the parents. Indeed, reliability of our chauffeurs and their professional service should be the differentiating factor when choosing a rental. 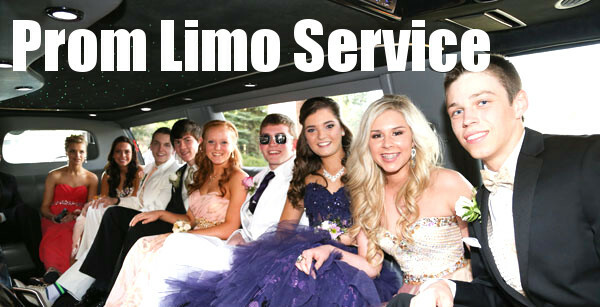 How much is a limo service for prom? Pricing for limousines and party bus rentals for prom vary depending on several factors including, the type of vehicle, how many passengers, and how long your young adult will be needing the vehicle. Occasionally there are specials or prom package deals available, so be sure to get a free quote online or call our customer service team for best pricing. When should I reserve a prom limo? It is best that you book limousine service for prom in advance. Usually the prom season is the same across the country and hence, the bookings tend to be full at this time. To prevent disappointment, it is best that you reserve your choice of a premier ride sooner than later. This will also ensure discounted rates, as pricing typically increases during prom season! In many cases party buses are a good option because the cost can be split with a larger group.